March in wild horse country started out looking so promising for an early spring. 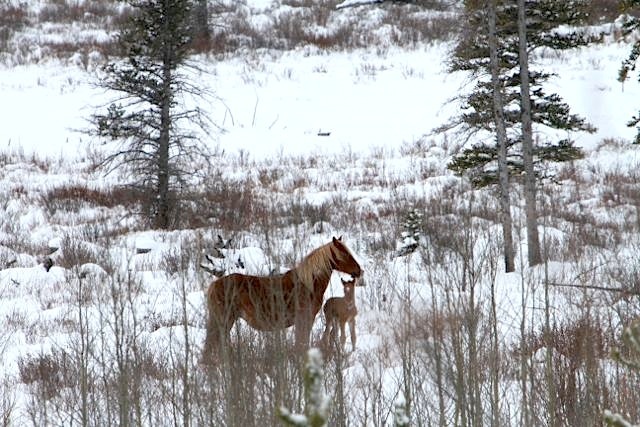 In the middle of the month we even found the first wild horse foal of the year that we told you about previously. Hopeful that we would be able to find it again, we have travelled out many times to check on its welfare. Such is our love for these beautiful animals and their welfare. The only time our trips took us on a half decent day we were unable to locate the foal and its herd. Nonetheless we continued to check on the herds we knew about, but no other mares at that time had produced any foals. In our travels out there it is amazing to me, even with all the time I do spend out there what you do see and what you do run into at times. 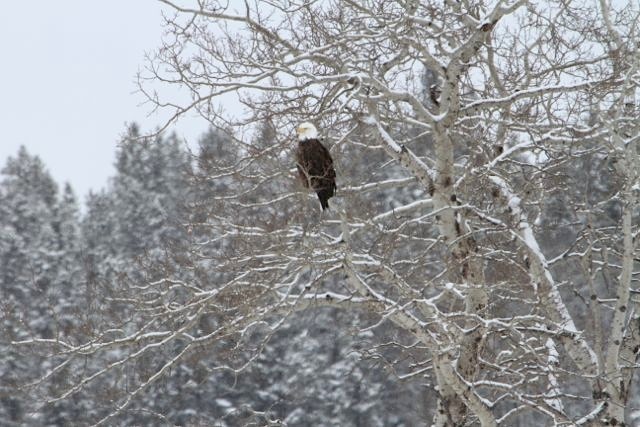 This includes the deer, elk, moose, bears, even cougars and so many different species of birds. On this trip however, with the only nice weather we’ve had in a month, we headed toward the Ya Ha Tinda Ranch. 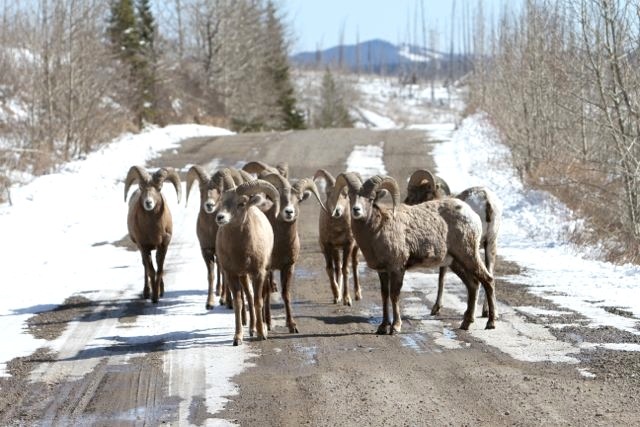 Travelling up the road, as has happened in the past, all of a sudden we were confronted by a herd of bighorn ewes and lambs. Numbering about 30 individuals they came right up to the vehicle to obtain the salt that clings to the vehicle. So interested in this were they, that I could lean out the window and physically touch them without them getting alarmed. 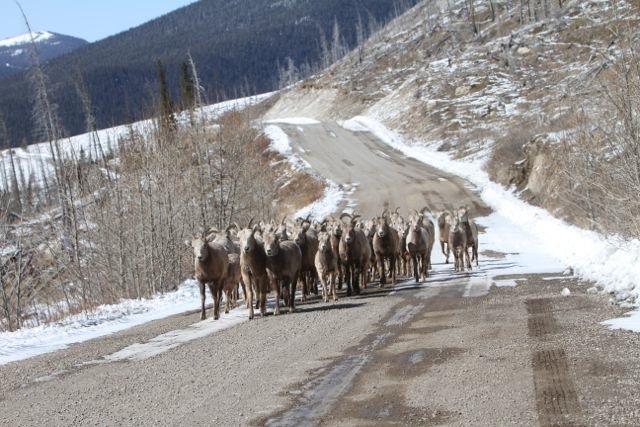 Next thing I knew coming from the other direction was a herd of bighorn rams. Caught in the middle all I could do was let my camera snap away in amazement and joy. Since then we have tried a few times to check on the horses. On the weekend of April 6, 7 & 8th a spring snow storm hit the foothills west of Sundre with a vengeance. Travelling down the back roads at times we were pushing the snow over the hood of my vehicle. 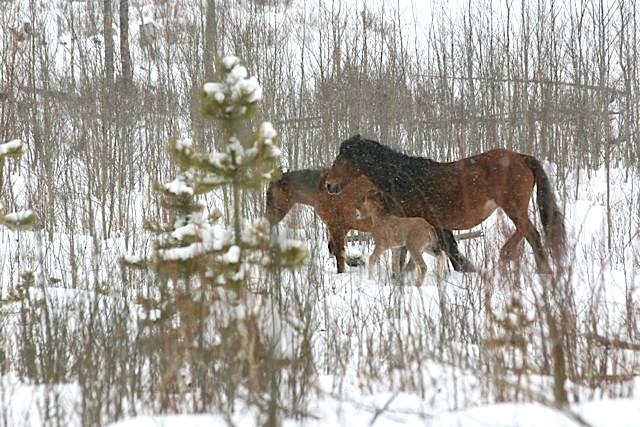 This type of weather is probably the worst thing that can happen to newborn wild horse foals. With this worry in my heart, I travelled many miles again checking on as many herds as I could find to see if there was any new foals. That day we could not even get into area where the foal we’d seen earlier in March was. Travelling through the snow it was nice to see that the herds we did find were all doing extremely well despite the despicable weather. 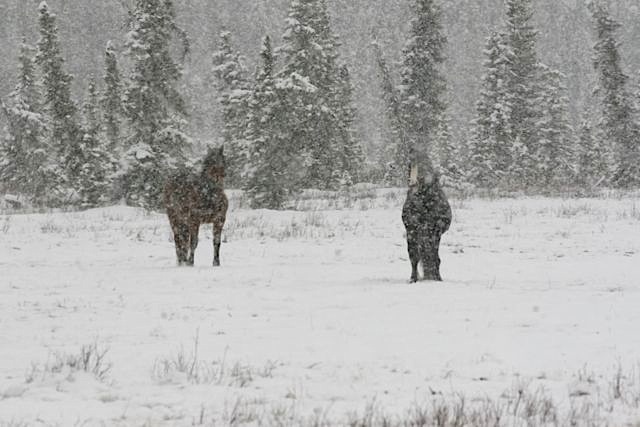 Here are two young boys who are trying to make the best of it in an open meadow during another snow squall. First snow, now sun. Oh, well. 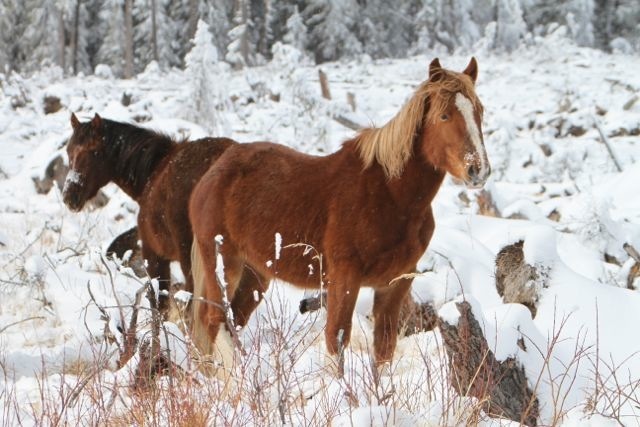 These mares belong to the stallion I call Bear and they were pawing through the deep snow to get what ever forage they could find. During the next week the weather did not improve at all and we were not able to travel forth until yesterday, April 15th. We left home with the sun looking like it was going to break through the clouds which would be welcome after two more days of heavy snow. By the time we reached the end of the pavement, guess what, it had started to snow again. 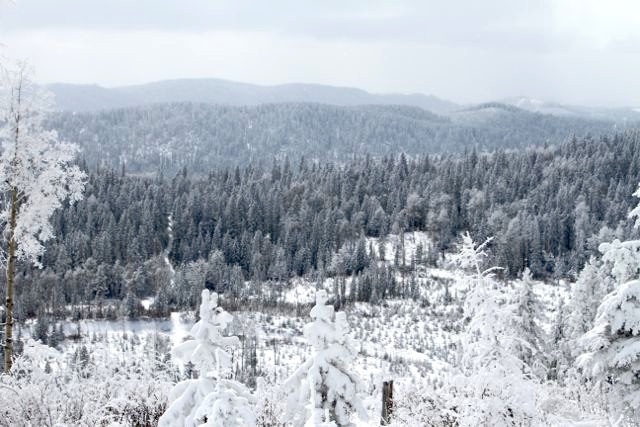 Many of the side roads were impassable and even the main forestry road had not been plowed yet. Undaunted, on we went and it was as we were checking the location of one of the herds we knew about, the gloominess of the day was suddenly lifted. In this herd we found two of the mares had foals with them. This young foal was still very wobbly on its feet having just been born hours before into this terrible weather. It was still amazing to watch it follow its mom through the meadow and the willow thickets as she secured a safe distance from us. Despite it being so young, you can see it was able to leap over some brush and through the heavy snow to stay close to her. 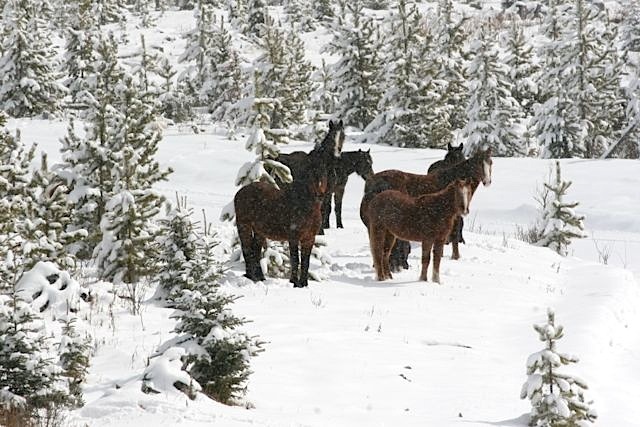 It is sights like this that continue to endear the hardiness of these beautiful horses to my heart. A couple of days older, this young one would follow its mom wherever she went for feed. It was amusing to watch it, as every once in awhile it would run around jumping and kicking as young foals do when they are feeling happy and secure. On the warning of the stallion off goes the mare, the foal and the protective other mare. 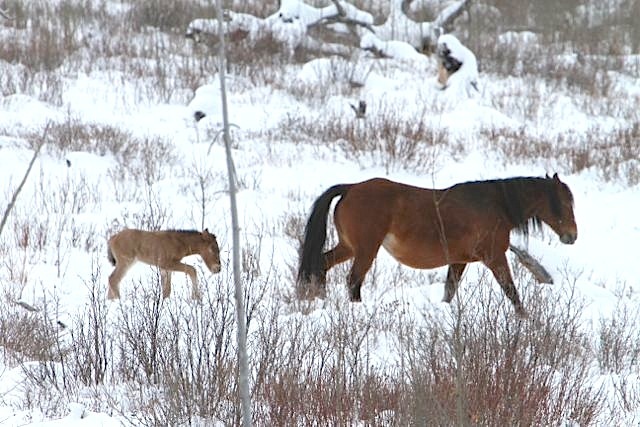 We noticed in this herd that when one of the mares with a foal would wander, another mare would follow closely and stay by her and the baby. No wonder we love them. The weather person is predicting warmer temperatures and sunshine over the next few days and this may be all these young ones need to gain strength and improve their chances drastically of survival. You can be assured where we will be going again in the next few days!